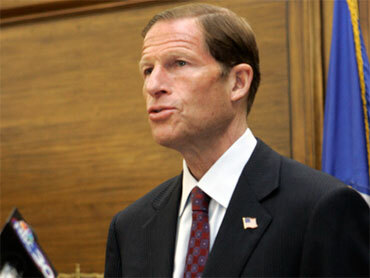 Did Richard Blumenthal Lie About Serving in Vietnam? Last night, the New York Times printed an explosive story suggesting that Democratic Connecticut Attorney General Richard Blumenthal - who is currently running for Senate - has falsely claimed he served in Vietnam. The newspaper has one incontrovertible example of Blumenthal making reference to "the days that I served in Vietnam" - a clearly incorrect statement. Blumenthal, as the Times reports, got at least five deferments that kept him out of the war. In 2003, in comments about American troops serving oversees, he also made reference to what he saw "when we returned" - and while that's not an explicit statement that he served in Vietnam, the implication is clear. Blumenthal did eventually enlist in the Marine Reserve, which allowed him to stay in Washington and work on projects like a Toys for Tots Drive. His campaign also says he served for six months at Parris Island in South Carolina, where many Marines go through basic training. Blumenthal's campaign is calling the Times story, which the campaign of Connecticut GOP Senate candidate Linda McMahon is claiming to have leaked to the newspaper, an "outrageous distortion" on his record - despite the evidence. And while that's a tough case to make, it is worth noting that there are also examples of Blumenthal being honest about not having served in Vietnam. In the speech linked here, he states clearly that he served in the Reserves. "Although I did not serve in Vietnam, I have seen first hand the effects of military action," he said. In general, Blumenthal, an aggressive advocate for veterans, seems to have tried to take advantage of ambiguity when talking about his service - which suggests the falsehood mentioned above may stem not from any explicit intent to lie but rather from being purposefully vague about his personal history. At the outset of the March 2008 comments in which erroneously claimed to have served there, for example, Blumenthal first referred to himself as someone who "served in the military during the Vietnam era, in the Marine Corps." That's the sort of phrasing that lets people think he was in Vietnam without actually crossing the line into being a falsehood. The Times notes another such statement, from a 2008 ceremony at Shelton's Veterans War Memorial Building. "I served during the Vietnam era," Blumenthal said. "I remember the taunts, the insults, sometimes even physical abuse." The problem with carefully walking this ambiguous line, of course, is sometimes you fall off track - and, as today's news illustrates, the repercussions for doing so can be significant.